Sat at the end of the Chippenham Bypass, close to the M4, this is a former Little Chef site with one of the last-remaining Burger Kings in this area. The Little ChefHistory opened in around 1998 and closed during summer 2016. For a while after closing it was still signed on the BP totem pole. Following the closure of the Little Chef, the site became a Burger King only trading site with the former kitchen being cordoned off by a fake wall and Burger King adopting the former seating area. In January 2017, Euro Garages gained ownership of the restaurant following KFG's sell of all remaining Little Chef sites and related Burger King only sites. 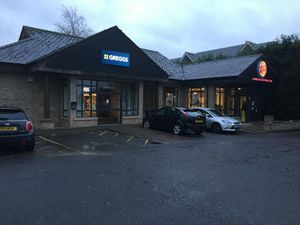 In October 2018, over two years after the closure of the Little Chef, the space was filled by a Greggs store. The 'Cepen Park Care Home' is accessed through the services. This site also has a second entrance off of another roundabout further along the A350. The filling station underwent an internal refurbishment during an ownership change to Rontec in March 2015 and was re-branded as Shop 'n Drive with a Subway store replacing the former On The Run cafe. The filling station then changed ownership again and underwent redevelopment again in March 2016 to reopen under ownership of BP Express on 7 April 2016. The site previously included a Chargemaster electric vehicle charging point situated in the former Little Chef car park. Since the closure of the Little Chef, the charging point was neglected and has now since been removed.